If you haven't noticed, there are two Greek Independence Day Celebration Greek Nights happening on Friday, March 22nd. With less than two weeks away, many of you may be asking which of the two should you spend your $15 dollars on that evening. Well, we here at DCGreeks.com contacted Mike Ahladianakis of Sigma Entertainment and Elias Zarkadoulas of Asteria Productions to give our readers the low-down on what we can expect on March 22nd. Read below as DCGreeks.com breaks down the Battle of the Greek Nights. Asteria's Kozmos Nights Independence Day Extravaganza w/Antenna Satellite's "Mana Giati Me Genisses"
Sigma Entertainment, a player in the DC area Greek community since 1990, notes its production and promotion of the "original" recurring Greek Night in the DC area at the Spy Club. 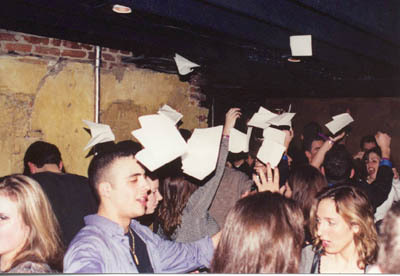 Over the years, Sigma has hosted Greek Nights at Zei Club, Diva, Pangea, Lu Lu's, Ozio and others. Sigma used to have a stranglehold on New Years Eve in the DC area, producing over ten hotel events, including the Millennium Celebration in Crystal City. Asteria Productions has been providing Greek entertainment in the DC Metro area for the past three years. Unknown to most is Asteria's experience in promoting events in various parts of the country, including Houston, Charlotte, New York, Atlantic City and Baltimore. Asteria's most recently promoted the widely attended New Year's Eve Glenti at the Double Tree Hotel in Tysons Corner. Asteria teamed up with Panorama Productions for two major Greek Nights on Thanksgiving and for the celebration of OXI Day at the end of last October. Sigma is shipping in live entertainment for the evening, with Neo Kyma headlining the night. Neo Kyma has been playing in New York City, Philadelphia and Baltimore. Members of the band have had the honor to play behind such big name stars as Dalaras, Marinela, and Mitropanos. Sigma will rely heavily on its heavy hitter, DJ Yianni, who has been doing Greek Nights in DC and Baltimore for several years. Sigma will also be featuring DJ Manolis, a relative newcomer to the DC scene, but a recognizable name in the Richmond and Tidewater areas. Asteria is shipping in much of its entertainment lineup for the evening straight from New York City. Asteria boasts the "legendary" "Maestro on the Armonio and Vocals" Spiros Kardamis, along with his band, Taraksis, featuring Gavrilos on Bouzouki, Yiorgos Stathos on Klarino, Pavlos on Drums, "the young and talented" Katerina on modern vocals, and Sofia Tzinih performing modern and traditional Greek hits. Taraksis has been performing at numerous clubs in NYC and Connecticut, including the Spilia, Sirocco, Fantasia, and Byzantio. Finally, in terms of big name talent, Xristoforos, who many of you experienced at Magkes & Koukles, will be making a special guest appearance. Coming off the bench for Asteria will be DJ Mixalis opening the evening, and DJ Liakos will take over for Taraksis, with Taraksis coming on to end the evening. Sigma's triple-coverage of non-stop Greek music will be blanketing Ooh La La all evening. On the main floor and the adjacent raised dance floor, Neo Kyma will be providing live Greek dance music. On the side dance floor, DJ Yianni will be spinning the latest in Greek club music. Finally in the VIP Lounge, which will be open to all for this event, DJ Manolis will be spinning as well. Sigma plans on utilizing all corners of its venue to its fullest, to provide a unique variety of Greek music. Asteria has provided DCGreeks.com a very methodical and detailed game plan for its Greek Night. Asteria plans to open with DJ Mixalis blending "a variety of 'loungey' and upbeat modern Greek music" to warm up the crowd. From there Taraksis will hit the crowd with "non-stop modern and traditional Greek music including the best Modern/Traditional Syrta and Zeimbekika." Asteria seems confident that the klarino and bouzouki will "combine for some of the most entertaining sounds DC has ever heard!" Asteria plans to keep the party going with DJ Liakos providing "the hottest and most upbeat sounds Greece and Europe have to offer." Liako points to "his unique and skillful mixing" in allowing the crowd to experience higher levels of "kefi" and "nostalgia." Liako promises that he won't be playing the same old Greek music that Greeks in DC area are used to hearing. He plans on unveiling some "Greek remixes that people will only hear at Kozmos Night." For the diehard fans, Taraksis will return around 3:30 to end the night with Xasapika, Zeimbekika and Hasaposervika. Sigma is banking on its winning percentage in the friendly confines of Ooh La La, which has hosted the last two Envy Greek Nights as well as the YAL Weekend Greek Night back in October. Sigma feels that it is "an excellent venue for a Greek Night, with capacity for over 800 comfortably and Three Dancing Areas for the Independence Day Celebration." Sigma is planning on maintaining Ooh La La's reputation for "plenty of standing room on the far side of the bar, with room for people to have a conversation far enough from the music without screaming into each other's ears, and plenty of tables to sit and relax with your parea." Sigma still hopes to maintain the lounge area with the glass doors that muffle the music as a refuge for those seeking "relaxed sit-down conversation," despite their plan for DJ Manolis to be spinning in that area. Asteria is unveiling a new arena for this Greek Night, in the West End (formerly the Red Tomato.) According to Asteria, "the West End blends class with style, providing room to dance and lounge." The West End features three bars, seven bartenders, and over 3000 square feet "to dance and mingle" in a very "Greek/Euro atmosphere." Asteria also promises "quality sound and lights" to give the venue a "full club effect." Let's face it, people go to arenas as much for free giveaways and other promotions and food as they do for the game. Sigma is giving away a ton of free stuff to entice the crowd. For starters, Sigma is giving free admission between 9:00 to 10:00. Sigma is also donating a portion of the proceeds from the evening to the MD/DC/VA YAL Dance Committee. Sigma will be giving away free tickets to the Angela Dimitriou concert in Atlantic City. There will also be door prizes from DC's most exciting new restaurants, salons, and major hot spots in the area. Sigma will also make sure to have a buffet of appetizers, because Sigma reminds us how "We all know that Greeks like to eat!!" Sigma also has a major announcement scheduled for this week regarding a special promotion at this event. But perhaps the most interesting part of the evening will be the flowers for throwing and the plates for breaking, adding an interesting fan-participation element to the night. Asteria has invited the boys from Antenna Satellite's hit TV program, "Mana Giati Me Gennises," Spiros Sourtzinos and Dimitris Megas, who will be taping live for the show on Antenna. This is the equivalent of getting on the jumbotron at the MCI Center during the first-round of the upcoming NCAA tournament during the Maryland game, because of Antenna Satellite's coverage in the U.S., Canada, Australia and Greece. The show airs on Antenna Satellite on Saturday nights at 10:40. Antenna Satellite will also be providing one complete Dish Network/Antenna Satellite set. Pathos Inc, will be providing two tickets to the Angela Dimitriou/Stathi Aggelopoulos Show in Atlantic City on March 30-31. Greek Music CD's will also be providing $100 dollars of the latest Greek CDs. Finally, Asteria is providing charter buses from St. Nicholas' church in Baltimore's Greek Town, to make it easier for the Baltimore fans to make it down to DC and to prevent any drinking and driving. Sigma is tailoring its event for the "cocktail culture." "In other words," Sigma adds, "everyone 21 years of age and older will have the pleasure of celebrating Greek Independence Day with some of the most beautiful, fun-loving, and passionate Greeks throughout the DC Metropolitan area." Sigma promises that "For those who 'desire' - this Greek Night will be 'ON FIRE!'" 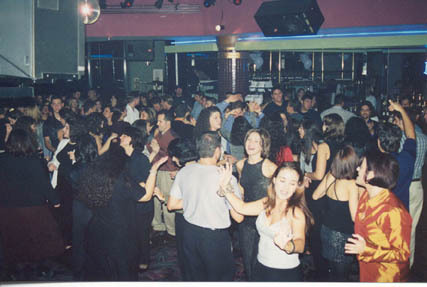 Asteria describes the crowd that comes to its Greek events as "people who are full of 'Kefi' and that have a 'Nostalgia' for quality Greek entertainment. They don't come just to socialize or see the faces. They come because they know that they will dance the night away, while mingling and having a good time." Asteria is expecting everyone from "influential Greek concert promoters from New York and Pennsylvania, representatives from the Greek and Cypriot embassies, fellow Greeks from Baltimore, Newport News, Virginia Beach, Richmond, New Jersey and Delaware," as well as its loyal fans from the DC area. Unfortunately for Asteria, The West End backed out on its original commitment to have the event open to the 18 to 21 crowd, leaving underage Greeks with no legal alternative for the evening. Sigma Entertainment is very aware that there is another Greek Night scheduled for the same night as its Greek Independence Day Celebration. Sigma explains that in the past it has "coordinated with other Greek organizations to avoid overlap of social events." Sigma further adds that "unfortunately, one particular organization was not able to communicate with all other groups and chose to schedule their event on the same night and time as Sigma's celebration event." Sigma explains that since it had already begun its promotion of their celebration event, while Asteria was still in a planning mode, Sigma could not reschedule its event. More so, Sigma did not want to reschedule and cause further overlap with other groups who too have scheduled and are promoting Greek Independence Day Celebrations for that weekend. "In an effort not to split up the Greek community, Sigma made an effort to combine both events and have a joint celebration, unfortunately that didn't work out." "Sigma strongly believes that the Greek community enjoys having the variety of events. The difference between a Sigma event and others are 'the little details.' Sigma has been fortunate to retain a large and consistent following as a result of their legacy within the Greek community for producing and promoting high-quality entertainment events that cater to all audiences both young and old." Asteria feels that "Antenna Satellite, a new up-scale venue, the best in Greek Entertainment from NYC and Washington, DC, and awesome door prizes" will put it over the top on March 22nd. Asteria doesn't apologize for scheduling its Greek Night on the same night. It adds that "More importantly, Greeks now have a choice, which is part of what Greek Independence Day is all about... having a choice. " Asteria states that it "is not about competing or counting how many Greek events take place month in and month out." Asteria's philosophy seems to be based on quality vs. quantity. It adds, "we pick and choose our days and events very carefully, as carefully as we possibly can, so they don't conflict with churches and other key fundraising organizations. Certain individuals, companies and outside factors do make this difficult, hence having to throw our event on the same night as Sigma Entertainment. As many of our supporters know this is the first event we have thrown in 2002 and we have waited until all of the key elements were present for our event to be organized." In terms of combining its Greek Night with Sigma's, Asteria points to its own preparation as preventing it from combining the two events. "We were approached by Sigma Entertainment a few days ago, and were asked to combine our events.," Asteria clarifies, "This took place after all of our promotions were organized and after all our entertainment was booked...as well as after all our advertisements were distributed. If the desire to work collectively existed, it is our belief that Sigma like any other company would have contacted us way before our event was completely organized, just as they had contacted numerous organizations within the community for their support. They know who we are and what we've been doing for the past two years for the DC community. Allowing someone else to simply take credit for our efforts and production, so that they can benefit and simply try to stay on top, is something that is not fair to our people, promoters or production. We welcome the opportunity to work with all companies and organizations for more successful Hellenic events...but only as professionals and at the table before events are organized and monopolies are attempted." "While Sigma always welcomes a healthy competition and 'fair play' with regards to entertaining the Greek community at large, this scheduling overlap could have been avoided with better communication. Sigma hopes that ALL Greek organizations will continue to communicate between each other with regards to their scheduling of Greek social events. By doing this, we will realize that collaboration - as opposed to conflict - is the best way to entertain a happy Greek community." "For the last two years Asteria Productions has become one with the people. This is why we have come up with the name Kozmos, because Greek Nights are all about the people and not about us the promoters. Our success comes from you the people having a good time. It's truly an honor to have the receptiveness and support that we have had from you the 'kosmos.'" "Asteria Productions intensions are to throw quality and successful events every time our name is associated with a function. We want to build higher expectations than those that currently exist in DC. In seeing other communities that have a choice in entertainment, Asteria Productions feels that DC's has been deprived of quality by not having a choice....Three piece bands and panigiria are signs of the past for DC as long as we're around. We want to be challenged and welcome the challenge of coming up with new creative ideas for successful events. We have built a very strong network...March 22nd is only the beginning!!! Our schedule of events both for fundraising organizations and as a company will put DC on the map as one of the hottest Greek spots in the nation."